So how much are you supposedly saving, Living Social? 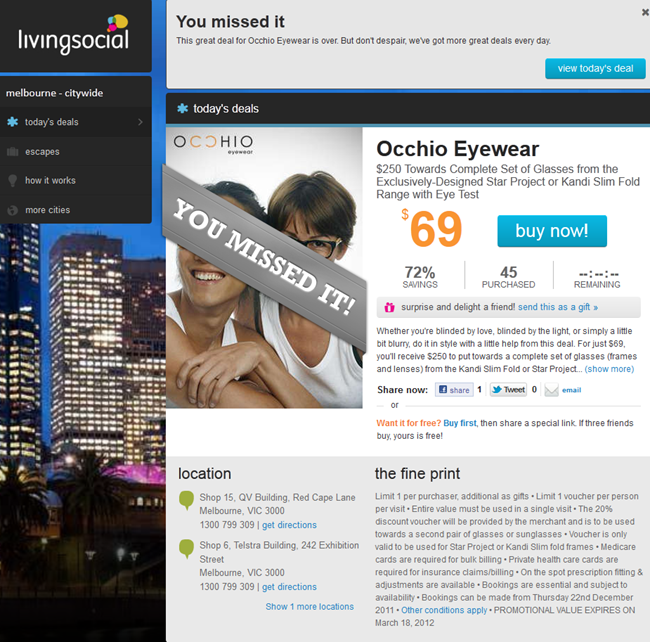 Both Living Social “deals”, both the same day, both identical as far as I can tell, yet one is “saving” 88 per cent, the other “only” 72 per cent. Doesn’t give you much faith in the veracity of the supposed actual prices, does it? Also, there is no breakdown of the supposed retail value (looking at this “deal”, is anyone surprised? ), which is a major warning sign when it comes to the reality of these “deals”.As usual, it’s just a warning that you have to use your brain before jumping into these things. Unlike 31 people in the top image.